Sorah Myung, as both a violinist and a violist has a busy musical career. She holds a concertmaster position at La Mirada Symphony Orchestra and an assistant principle viola position at Mozart Classical Orchestra in Southern California. Also, she has been playing at the AIMS music festival in Graz, Austria for the last seven seasons. As a dedicated pedagogue, Ms. Myung is in great demand as a teacher, a coach and a lecturer. She gave master classes in Suzuki violin school in Hong Kong and held an artist faculty position at Capistrano International Chamber Music Festival in San Juan Capistrano last summer. Recently she was invited to give lectures at a music college in Philippines for two weeks. Ms. Myung was an adjudicator at Irvine Junior Ensemble Music Festival (JEM), Association of Christian School International Music Festival (ACSI), and New Mexico Fine Arts Festival and she will be an adjudicator at Newport Mesa Solo & Chamber Ensemble Festival and a evaluator for Music Teachers’ Association of California (MTAC) Certificate of Merit program this year. 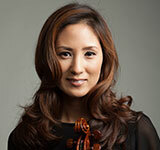 Ms. Myung received her BM degree from Oberlin Conservatory of Music and MM degree from Yale University School of Music. She is currently a string faculty and a chamber music coordinator at Vanguard University in Costa Mesa and a string coach at Irvine and Laguna Beach Unified School district.